On Sunday 2 November we closed our doors for the 2014 season. We’d like to thank all our guests for having made the season possible. We’ll be back on 27 March 2015. As always we’ll be working on our facilities and services throughout the winter to ensure you have the high quality welcome you deserve in 2015. If you need us before then, you can contact us through our booking centre: Tel. : (+34) 977350444 e-mail: reservas@lesdalies.com See you in 2015! The 50th edition of the RACC Rally Catalunya will be held from 23 - 26 October. As in the past ten years, Salou will be the headquarters of this already consolidated WRC rally. Once again PortAventura will provide the facilities for the service park, rally office and official press room. The first edition, known as the "Rally Catalunya", was held in 1957. After a break of several years, the competition returned in 1964. Since 1973 the Rally Catalunya has gone from strength to strength to become what it is today. It has been part of the Championship of Europe since 1980 and became one the exclusive group of competitions counting towards the World Rally Championship in 1991, when its headquarters were still in Lloret de Mar (Costa Brava). In 2005 the name was changed to RACC Rally Catalunya-Costa Daurada, a turning point in its history when its nucleus was transferred to Salou. It was in 2010 that it became consolidated as one of the most innovative and technically challenging competitions in the World Rally Championship by proposing a mixed surface section (dirt and asphalt), the only WRC rally with these characteristics. During the three days of the competition, the organisers have prepared important innovations and a wide range of events to celebrate this 50th anniversary. A commemorative 50th anniversary plaque. On the occasion of the 50th anniversary of the Rally Catalunya, the RACC has commissioned a commemorative plaque in gold and black highlighting the number 50. This plaque will no doubt become a collector’s item. The longest section in its history: 50 km. Combining modernity with tradition, the RACC has designed a special section, the "Scala Dei" of exactly 50 km to commemorate its 50 years of history. It is based on the "El Priorat" section of previous years, but with variations to the route. It will be held on Saturday 25 October together with the "Tivissa" and "Colldejou" sections and, of course, the urban special along Salou’s seafront promenade. Start of the Rally with a mixed route. This is one of the main changes for the 50th RACC Rally. For the first time in its 50-year history, the first stage on Friday 24 October will be mixed instead of asphalt only. It will consist of three very difficult and demanding sections: the all-dirt-road "Gandesa" and "Pesells" sections (7 km and 26.59 km respectively) and the 36.58-km mixed surface "Terra Alta" section. In short, a considerable challenge for the drivers and their crews. The classic cars are back! After a break of some years, as part of the 50th anniversary celebrations, this year’s rally will include classic cars from previous WRC rallies. In their day, the stars of the World Championship and now a fine sight to behold, these cars will be on display next to the podium on the seafront promenade along with the names of those who drove them to success. Moreover, on Saturday and Sunday (25 and 26 October respectively), they will cover some of the rally sections (between the race circuits). Salou is ready to host the latest edition of the Rally RACC Catalunya that this year has announced modifications to its itinerary, changing some of the initial dirt track stages to asphalt stages. Like last year, the first event of this year’s Rally Catalunya will be in Barcelona, where many fans are expected to gather. However, the epicentre of the Rally Costa Daurada is here in Salou, where a two-kilometre super special stage will be held in the resort’s urban centre. This 49th edition of the Rally Catalunya is the ninth to be held entirely on the Costa Daurada. The main changes in the 2013 edition of the Rally Costa Daurada involve modifications to the route and for the first time it will include three nocturnal stages over asphalt to begin the rally on Friday 25 October. On Saturday 26 October, the second day of the competition, the asphalt stages will once again be the most significant. One of the most decisive stages in this year’s Rally Catalunya will be a couple of laps around Riudecanyes, El Priorat and Colldejou. The competition will end with the two-kilometre town centre stage in Salou, where a large number of fans is expected to congregate. The two-kilometre super special stage in Salou will be held on Saturday 26 October. In addition, the town will be the setting for the shakedown on Thursday 24 October. Salou is also the location chosen for the prize-giving on Sunday 27. This event will be held on Sunday at 16:35 on the Jaume I Promenade. A photograph of the Citroen DS3 taken at night on Salou’s seafront promenade has been chosen as the official poster of this year’s Rally Catalunya, the points from which count towards the Word Rally Championship. 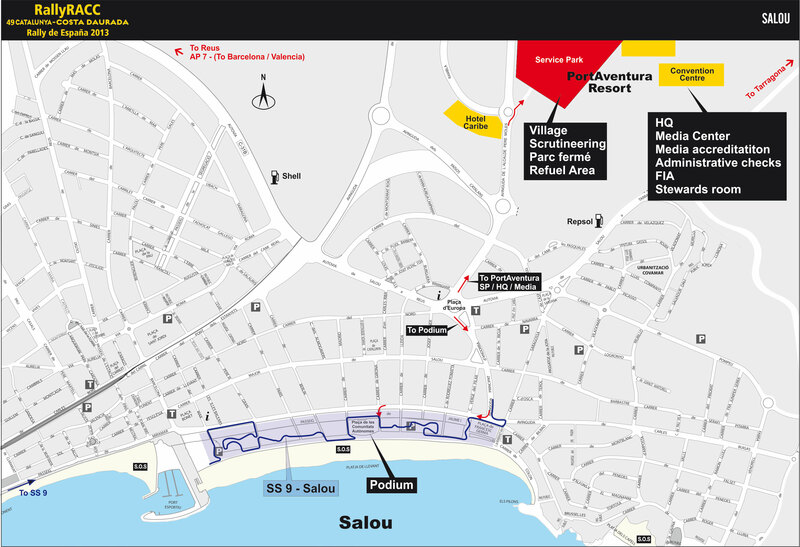 To make the most of this exciting event, rally fans need to stay in Salou. We have prepared special rates in our apartments for the rally weekend. If you would like to know more about the special offers available, please contact our reservations department by e-mail at reservas@lesdalies.com or by telephone on (+ 34) 977 351 199. Ven a Les Dàlies y disfruta de un día inolvidable en el parque PortAventura (a sólo 5 minutos del complejo). Nuestro pack incluye: -1 noche de alojamiento en uno de nuestros apartamentos -Desayuno -Entradas al parque -Parking gratuito (según disponibilidad).